Joy Creek Photo Archive (c) all rights reserved Small. 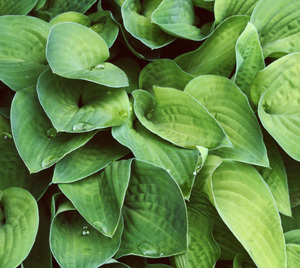 Hosta 'Gold Edger'(Aden) produces very dense, heart-shaped, chartreuse leaves which make this low growing hosta ideal for lining a shady path or border. Lavender flower spikes rise a foot above the foliage. July. 1.5 ft. x 2.5 ft.